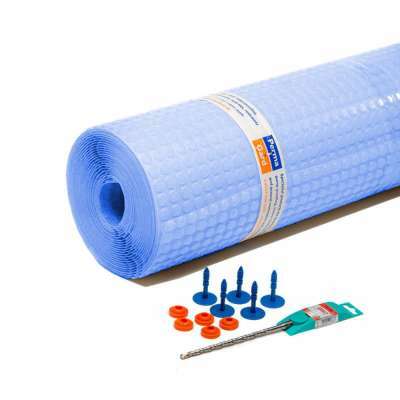 Damp proof membrane kit for isolating damp walls above ground and providing a key for a range of finishes. This tough but pliable Isola Platon Mesh Membrane is manufactured from polypropylene (PP) and is designed to be applied to internal walls to protect against damp and the reappearance of salts. The membrane is impermeable and resistant to moisture. It can also be installed straight away after the injection of a new damp proof course, dramatically reducing the project time. One side of the membrane features 2.5mm studs located at 25mm centres in a regular pattern in both directions. The integrated polypropylene mesh on the other side provides a firm key for new finishes such as render or dot and dab. This is a 20 square metre roll at 1 metre high and 20 metres long. It comes as part of kit. Once a new injection damp proof course has been injected, you can simply apply the Platon mesh membrane to the walls affected. You then have the option to either dot and dab or render directly to it. The mesh membrane can be cut to length with a sharp knife or scissors. It is easy to bend around corners. 1m x 20m (20m²) Sold with accessories to complete the job. Can Platon PB2 Damp Proof Membrane be bent around corners? Yes platon PB2 Dampproofing membrane is flexible and will bend around internal and external corners without the need to cut and join the membrane.